With a flash you can turn daylight into darkness! The photo above was shot in daylight. Yet, it looks like a night-time shot. The trick is to set your camera to manual, and set exposure time, aperture, and ISO so that when you take a picture, the frame is dark. If you then add light from a flash, whatever the light from the flash hits will be lighted. Anything else will remain dark. This works in principle, but there is a snag: Normally, the shortest exposure time you can use, and still get the flash to sync, is 1/250s. At 1/250s, you may not be able to get the photo dark enough, even if you use the lowest ISO setting, and the smallest aperture (highest f-stop number). High-speed flash to the rescue: With a DSLR, you can set the camera to high-speed sync. This means you can get flash sync at much shorter exposure times than usual. The downside is that the sync won't be perfect. A lot of the light from the flash will hit the shutter. This effectively reduces the strength of the flash. You can still get excellent results though. 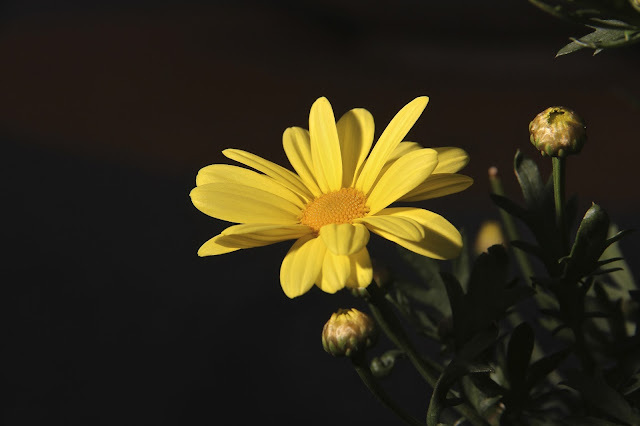 I shot the flower at 1/2000s, f11, ISO 160. the combination of short exposure time and fairly small aperture reduced the ambient light to almost complete darkness. The flash lit the flower. Quite easy to do, and a lot of fun.